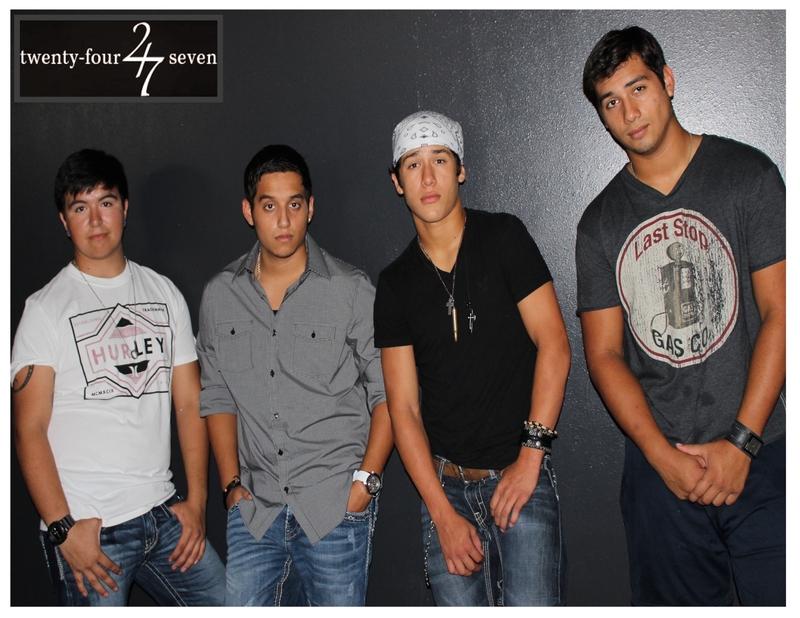 TWENTY FOUR SEVEN- has become one of the most popular rock bands to hail from Texas with their sonic melting pot of signature blazing guitar riffs, thunderous drums, pulsing bass lines, & vocal harmonies that will melt your hearts out. The young rockers have been credited with the band that will revive the mainstream popularity of rock music with comparisons to Guns N’ Roses, & The Foo Fighters. Founded by brothers Nikko Vallejo (guitar/vocals), Matthew Vallejo (drums/vocals), & cousin Josh Moya (Lead Vocals). Soon after the band’s formation, Christian Ruiz (bass/vocals) came in to complete the band’s dynamic lineup, the band’s blood-lined chemistry is evident as soon as they hit the stage. With the youngest member at the age of 18, 24-7 is way ahead of the game and ready to set the world on fire. 24-7 is currently sponsored by Texas Music Water and guitar player Nikko Vallejo is endorsed by PRS guitars & XTS custom pedals. 24-7 is currently in the studio working on their 2nd album with a tentative release date of January 2018. 24-7 has had the honor to perform at venues such as Stubbs, ANTONES, ThreadGills, House Of Blues Houston, Claytons In South Padre, Revolution Live Ft. Lauderdale & House of Rock in Corpus Christi naming just a few. 24-7 has won numerous contest & battle of the Bands most recently being selected from thousands of music resumes that came from artist all across the Nation. The selection process ended with the best 100 artists in America. 24-7 finished the competition in the top 10. Stay tuned for the latest news on 24-7, new music and upcoming performances. Produced by AJ Vallejo of the award-winning Austin band Vallejo, 24-7’s 2nd album has the Industry waiting in anticipation of what the young rockers have to offer. What-ever the out-come, the band is here to stay and have some fun. 24-7’s current music is available @ Austin’s waterloo records, and Corpus Christi’s Surf Club records. Downloads are available on I-tunes, CD baby, & Amazon.com. Stay tuned for the latest news & shows! hey yall are such a good band.yall played at my school jackson rosavelt elementrey. Finally found yalls site. awesome job guys! Suggestion: songs from Breaking Benjamin, Alter Bridge or RATM. I think josh could do some of their songs, eh depends on which one. well I guess I’ll see u at e3 josh have good year bud. We are working on a Summer Tour for 2013.Do you recommend any cool all age venues? do yall play for birthday parties?? BUY 24-7'S MUSIC ON I-TUNES HERE!